Back in 1992 I first visited the old abandoned USDA Horticulture station in Cheyenne, Wyoming. Our tour guide was Gene Howard, who had been the stations last superintendent. Gene showed us around the arboretum of plants collected from around the world. As Gene walked us through the station showing us one interesting plants after another, I was smitten. I fell in love with the Cheyenne Station that very day. 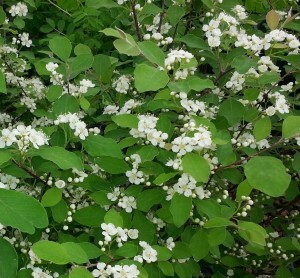 One of the plants Gene showed us was a very attractive shrub from northern China called the Sungari Redbead Cotoneaster. I noted it was covered with bright red fruit. Gene said it was the best cotoneaster of all, not only for its beautiful white flowers, and its showy red fruit, but because it was the most hardy of all the Cotoneasters in the world. That was quite the endorsement and I decided that it needed to be in the nursery trade. As the propagator at Fort Collins Wholesale Nursery I tried hard to make that happen. For several years I tried to propagate it but each attempt ended in complete failure. So I gave up. Years passed and fortunately I was able to propagate many of the other wonderful plants at the station, and Gene Howard and I developed a friendship. He became my mentor. But in the spring of 1999 I received a call from Genes wife who told me Gene was in hospice and wasn’t likely to live very much longer, and he wanted me to come up and see him one last time. I left right away. Gene and I talked for a while, and I thanked him for sharing his knowledge with me and he thanked me for paying attention to his life’s work and for bringing back into the nursery trade so many of the best plants from the Cheyenne Station. But he then added in a weak voice, “But you missed one. The Sungari Redbead Cotoneaster. I know you said it didn’t propagate very well, but can you please keep trying? It’s too great a plant to let it fall by the wayside.” So I promised Gene I’d keep trying. Gene died a couple of days later. In the intervening years, I finally figured out its propagation requirements. This year Plant Select® is bringing to you Gene Howard’s last wish, the Sungari Redbead Cotoneaster. Enjoy. I love Mr. Skogerboe’s story on the Sungari redbead cotoneaster (Cotoneaster racemiflorus var. soongoricus) as posted on the plantselect.org website. I just this morning discovered this lovely-looking shrub at a local plant nursery in Longmont, Colorado. I would like to plant a few of these shrubs along an open split-rail fence on the west side of my property. ** Likewise, is it a low-maintenance shrub? Many thanks in advance for any/all advice and informtion. Have a nice Labor Day Weekend ahead! So glad you asked all these questions and you’d be pleased to know that the answer to all of them is YES. This is the perfect Plant Select® plant for your situation. Enjoy!